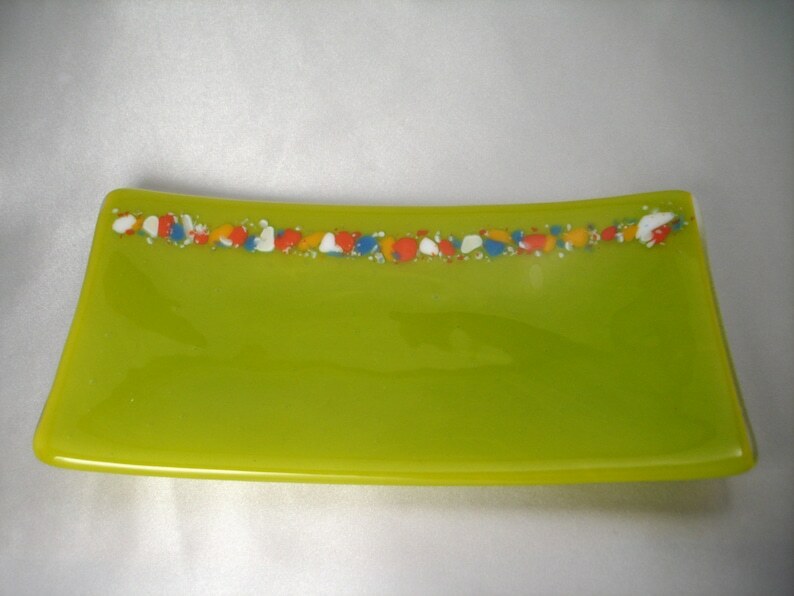 This bright green sushi dish measures approximately 9 inches long, 5 inches wide and 1 inch raised at the edges (23 x 13 x 2.5cm). It is lead free, food safe , dishwasher safe and incredibly durable. This unique dish was created in my studio over a 3 day process- designing, cutting and layering the glass, followed by 14 hours in the kiln to fuse the glass into a single sheet, and finally another 14 hours of slumping the glass into the curved sushi dish shape. This dish is extremely durable and should provide you MANY years of enjoyment.